32Krew’s SMILEY has just released a film clip for his uplifting Australian Hip Hop Supports CanTeen track IMAGINE feat The Long March. CanTeen Album Project Manager Rachel Pietracatella talks to the young Perth Rapper about the clip, how Hunter got him involved along with numerous burning questions. Smiley is a member of WA’s 32 Crew: has been rapping for around six years and released his debut album The Suspended Sentence in mid 2010. Rachel: Hi Smiley, thanks for chatting with me today. How did you get involved with the CanTeen project? Smiley: Hunter was on tour with us in Geraldton, after the show that night he explained the project to me and asked if I would be keen to include a song. It was a no brainer for me, I jumped at the invitation! Rachel: Did Hunter ask for anything specific track wise for the album? Smiley: Yeah he did. “Keep the swearing to a minimum Smiley” I heard CanTeen were strict on what they would agree to and it made sense what with it being for a children’s charity. But do you know how hard it is to rap and not swear!? Seriously..
Rachel: You are the second artist to make a film clip for their album track along with Canberra’s BRB for Hard Times do you think any others will follow suit? Smiley: I hope so! It’s a great cause to be promoting but I know time is always short in this industry so some may not be able to. Rachel: Where did you shoot the film clip? I see you have some Perth Headz in there, care to drop any names? Smiley: The clip was shot by Linney from Burd Cage Productions in Perth. We had cameo’s from Dazastah, Anto from The Long March, Porsah Laine, Marley Hunter.. Actually we had too many to list but those in the know will spot em A big thanks to everyone who helped put the song and clip together! Rachel: What is your favourite track on the album? Smiley: When We Were Kids by Hunter, Dazastah & Drapht. But there’s heaps I’m diggin’, like Self Destruct By L.S.D. & the Missus, Roll by Daz and Porsah, Colours, Handmade, Nothing To Lose… I have to stop don’t I…? 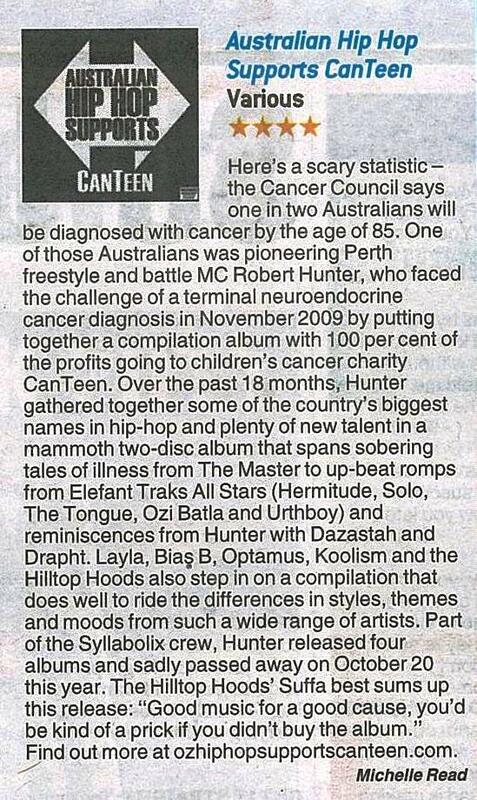 Rachel: Haha yes…Why do you think the Australian Hip Hop Supports CanTeen Album has been so successful? Smiley: Because it’s genuine. It’s great music for all the right reasons. The people have gotten behind it because they believe in Hunter’s vision. Rachel: There is a documentary being made about Hunter, what do you know about that? Smiley: I know I want to see it the second it’s done but some parts are going to be tough to watch. I believe they’re in the editing process at the moment. Rachel: If you had $50 grand to donate to a charity, which one would it, be? Rachel: Do you think that there will ever be another hip hop charity compilation? Do you think this brought the hip hop community closer together? Smiley: I really hope so but there’s only a handful of people that could make it happen. This album brought back that support Australian hip hop, big family vibe. It took a lot of work behind the scenes to organize, finalize, release and promote this compilation. People with that kind of dedication are a rare breed. Rachel: What is next for Smiley? The late Perth rapper Hunter will be inducted into the WAM Hall of Fame at the end of May. Hunter was an established member of the Australian hip hop community and a highly respected influence to many emcees. Hunter was a pioneer of the WA rap scene and part of the Syllabolix Crew that featured the likes of Drapht, Dazastah, Layla and others. Since making his mark in the early 90’s as a battle MC, he went on to release four albums. Hunter passed away in October 2011 after a long battle with cancer. Each year WAM as part of the WAMi Festival inducts important members of the WA music industry into the WAM Hall of Fame. 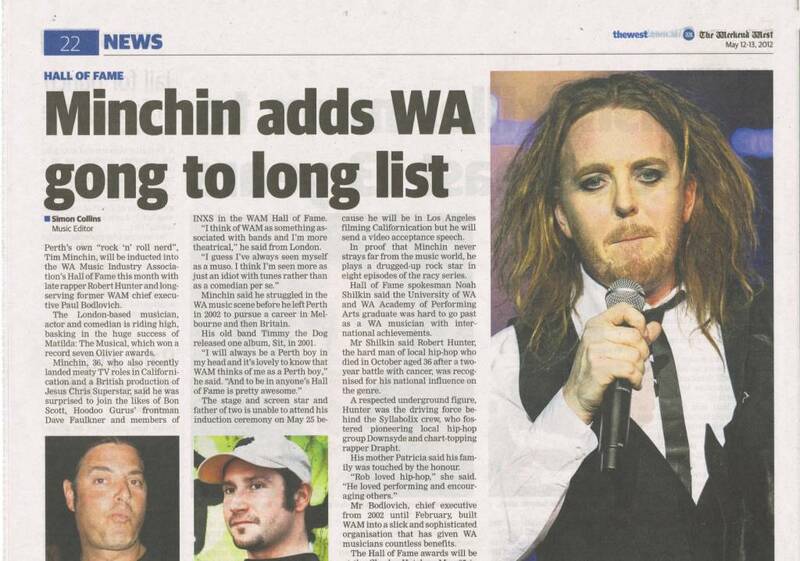 Three inductees are being honoured in 2012; WAM are delighted to announce that this year WA musical comedy guru Tim Minchin, influential member of the Australian hip hop community, the late Robert Hunter, and the former, longstanding CEO of WAM Paul Bodlovich will be inducted at an event on Friday May 25 at The Charles Hotel. The Hall of Fame induction will happen on Friday May 25, at the Music Industry Reunion Night at The Charles Hotel Front Lounge from 6pm. The night will feature performances from Matt Taylor, Dom Mariani, Paul McCarthy and Annie McNeil, and entry is $5, with proceeds going to Support Act Ltd, MIRC club development and future music industry charity events. The WAMi Festival will happen May 26 to June 2, visit wam.asn.au/wamifestival. 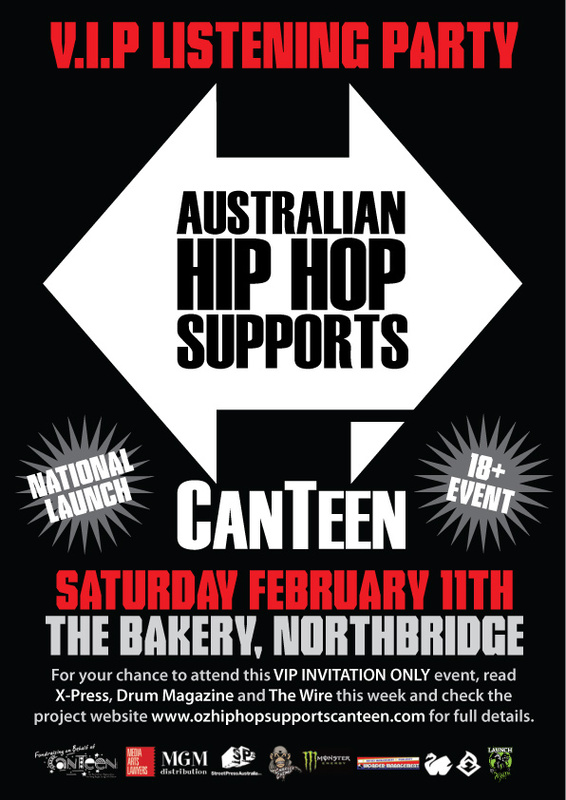 WIN Tickets to the Australian Hip Hop Supports CanTeen National Album Launch Listener Party at the Bakery Saturday February the 11th in Perth! We have 25 double passes to the National Launch of the Australian Hip Hop Supports Canteen album listener party. Stating your name, surname, age, address, phone number, and the answer to this question.  You must be 18 plus to enter this competition as it is a licensed event.  Winners will be chosen on a first in first served basis that have supplied ALL requested information so please check that you have your full details and a correct answer to the question or your entry will be considered void.  Winners will receive confirmation and double pass by the email address provided.  Proof of age must be shown for entry at the event. Double pass does not guarantee entry if not in compliance with venue policy.  Please note the competition does not include transportation and accommodation to or in Perth.  Please PRINT and PRESENT your emailed invitation at the door. Any other entry instructions will be detailed (on the email invite). Artists and music industry people from all over the country will be flying in to Perth to celebrate the release of the Australian Hip Hop Supports CanTeen album on Saturday the 11th February at the Bakery in Northbridge Western Australia. Three hundred lucky VIP’s will get a chance attend the national album listener party with celebrity DJ’s manning the decks and the 32-track album played at intervals during this most auspicious of hip hop nights. The charity album was the final project directed by the late Robert Hunter who died of cancer aged 36, a few weeks short of its release and is available nationwide in record stores and on iTunes. More than forty artists including ARIA winners Hilltop Hoods, Drapht, and Koolism donated a brand new track to the late Robert Hunter for inclusion on a charity album which is raising funds for CanTeen, an Australian charity that supports young people living with cancer. “It’s going to be strange without Hunts being there but I’m looking forward to getting together and listening to the album with all the crew.” said Layla who’s track Love Times Pie Recurring.. is receiving airplay on Triple J and indie stations throughout Australia. The album is proudly sponsored by MGM the Groove Merchants, Media Arts Lawyers, Streetpress Australia, and Monster Energy. Doors open at 8pm for this 18+ listening party. For your chance to attend this VIP INVITATION ONLY event, read X-Press, Drum Magazine, and The Wire this week and check the project website http://www.ozhiphopsupportscanteen.com for full details. How do I get a VIP double pass to the launch in Perth? The Australian Hip Hop Supports CanTeen album released last December has found its way to an army of file sharing sites offering free downloads to members sparking a number of angry and still grieving music fans to vent their frustration over Facebook in the past 24 hours. A spokesperson from the project said they were doing everything legally possible to halt the spread of internet sites offering the free download of the album. The 32 track compilation album features ARIA award winning artists the Hilltop Hoods, Drapht and Koolism as well as many up and comers and was to be a vehicle to raise funds for the cancer charity CanTeen. The charity album was the final project directed by the late Robert Hunter who died of cancer aged 36, a few weeks short of its release. “I have had quite a number of concerned fans of Hunter’s contact me in response to the illegal links.” said the albums project manager Rachel Pietracatella. “A lot of them are still grieving the loss of Hunter and are upset that the funds from album sales are being diverted from the charity.” she said. “Many music fans have bought multiple albums to show their full support knowing that the proceeds are going to such a worthy cause, those same people have also donated cash funds on top of it and are rightfully distressed that anyone can go online and download it for free.” she said. “Our lawyers have served multiple cease and desist notices today to the sites that have infringed copyright.” she said. “A notice was served on Filesonic last Friday and they complied by removing the illegal link, I am expecting the sites that have come to our attention today to do the same or face legal action.” said Rachel Pietracatella.